A global team of scientists including a Field Museum researcher have discovered what they describe as the earliest known dinosaur relative, a 6-foot-long lizard-like carnivore called Teleocrater rhadinus. The discovery, detailed in a paper published in the scientific journal Nature, dispels the long-held hypothesis that dinosaurs’ earliest ancestors were small animals that walked on two legs – essentially miniature versions of dinosaurs. As opposed to dinosaurs, Teleocrater likely resembled the monitor lizards alive today, the scientists say. They estimate Teleocrater was 6 to 10 feet long, with a long neck and longer tail, and weighed 20 to 65 pounds. It likely stood about 2 feet tall at the hip. The name Teleocrater rhadinus means “slender complete basin,” a reference to the animal’s lean build and closed hip pocket. Although it shared some features with dinosaurs, like the jaw muscle attachments at the back of its skull, Teleocrater had more in common with its more distant crocodilian cousins, the scientists say. Of most interest to the researchers were Teleocrater’s crocodile-like ankle joints, which could rotate from side to side as well as flexing up and down, compared to dinosaur and bird ankle joints that could only hinge up and down. The more versatile ankle joints would have given Teleocrater a more spread-out, crocodile-like gait rather than an ostrich-like trot. The findings provide new insight into the evolution of archosaurs, a group that contains dinosaurs, birds, pterosaurs (flying reptiles) and crocodilians. “We used to think that many of the distinctive features of bird-line archosaurs evolved very quickly after they diverged from the crocodile line because early bird-line archosaurs were small and very dinosaur-like,” Angielczyk said. “However, Teleocrater shows us that bird-line archosaurs initially inherited many crocodile-like features from the common ancestor of all archosaurs, and that the ‘typical’ bird-line features evolved in a step-wise fashion over a longer period of time. The study was conducted by scientists from the U.S., UK, Argentina, South Africa, Sweden and Russia. Angielczyk and his colleagues said that while Teleocrater was being formally named for the first time in their paper, it was first identified by British paleontologist Alan Charig in the 1950s, using fossils collected in the 1930s. 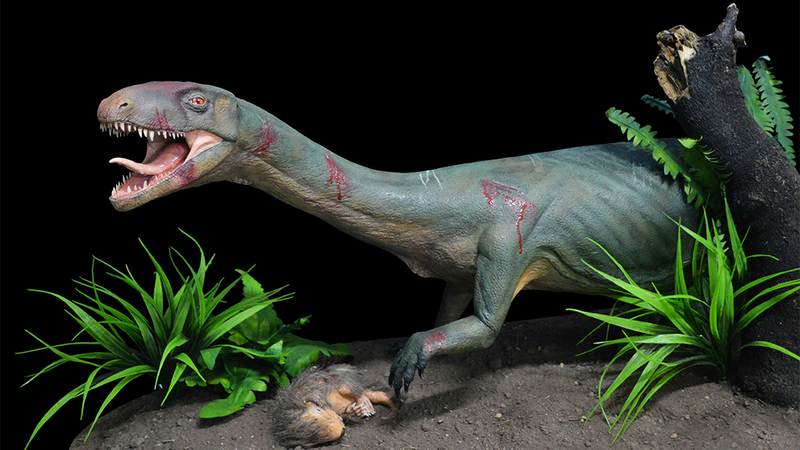 Teleocrater’s connection to dinosaurs remained mostly unknown until Angielczyk and other scientists discovered fossils on a recent dig in Tanzania. “We found fossils that we thought might be from Teleocrater, but it wasn’t until we were back in the lab that we realized we’d found something really amazing,” Angielczyk said. March 28: More than 30 million objects are stored behind the scenes at the Field Museum. A new exhibition addresses how scientists from all over the world are using the vast collections to make new discoveries. Oct. 14: Thanks to an inquisitive Field Museum researcher, a nearly 40-million-year-old fossil housed at the institution has been identified as one of the earliest relatives of dogs, bears and foxes known as a beardog. Sept. 14: Field Museum scientists are ready to identify your strangest natural possessions this weekend. Learn more about Identification Day.